While I was out orchid hunting I passed a hidden dam where Pobblebonks – a.k.a. 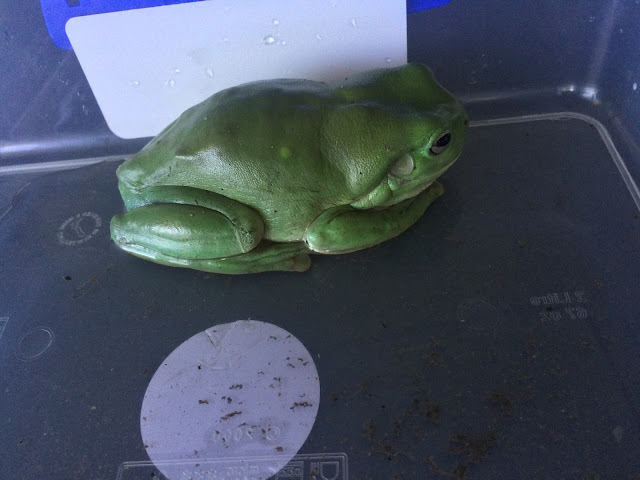 Eastern Banjo Frogs were happily singing and yesterday my son sent me a photo from Queensland of a tree frog he had found in the air conditioner. These two incidents got me thinking about the status of frogs, which have been in worldwide decline since they started being closely monitored in the 1980’s. This matters because they are our canaries in the coal mine, telling us about the health of our environment and especially our water. It wasn’t that long ago that standing waters of any kind– frog habitat, were anathema to councils being associated with waterborne diseases and thought to be breeding grounds for mosquitoes and other unpleasant things. Swamps and wetlands were also regarded as waste ground which should be put to more profitable use. They were filled in, drained, paved over with concrete and largely forgotten about. Then we discovered that wetlands played an important role in maintaining the water table, stopping too rapid run –off and thereby possibly preventing flooding, and that they also filter and trap pollutants before they reach our waterways. And these are just their importance to humans. They also provide food and shelter for countless other species such as migratory birds, reptiles and insects and in a clean and balanced environment, far from enabling mosquitoes to breed, frogs and dragonflies eat mosquito larvae. Unfortunately frogs are also sensitive to all kinds of toxins which is why they are among the first species to disappear in the face of environmental degradation. According to a 2017 report worldwide we have lost around 168 amphibian species (this includes salamanders), almost one third out of a total of 7,000 are threatened and a further 42% are in decline. The Australian picture is not much more encouraging. Out of 214 known species four are extinct, 15 are endangered and 12 are vulnerable. Tasmania fares better on the whole. Of its eleven species of frogs only one – The Green and Gold Tree Frog, is listed as endangered. The reasons for their decline are not clear, though several factors are being considered. While land clearing, habitat fragmentation and environmental degradation are likely suspects, frogs have also disappeared from almost pristine settings pointing to other possibilities including increased UV, radiation, changing climatic conditions, predation by feral animals or introduced species and the chytrid fungal disease. Most likely it is some combination of these such as weakened frogs being more likely to be infected or vice versa. While research continues and scientists are experimenting with vaccines against Chytrid Fungus, it is precisely because protecting habitat alone is not enough, that Tasmanians are being encouraged to include frog friendly features in their gardens. If you do, don't take your frogs, water or tadpoles from the wild, in case you introduce disease. It's much better to let them find their own way. Here in Hobart, local schools have been working together with the City Council and private industry to develop frog ponds at Knocklofty. Initially seven to eight Tasmanian frogs were found there. Sadly, some succumbed to the Chytrid fungus and when I checked a few days ago, the frog ponds appeared to be dry, silent and frogless, despite all the rain we have had. I‘m hoping it is just too early in the season and we’ll soon hear that happy Pobblebonk again. By the way, if you want to ensure that you don’t spread the chytrid disease yourself, please read the Parks website. I do always wash my boots when I have been bush, so that I don’t spread that other disease which is affecting our native plants, but chytrid can also be spread by car tyres, camping equipment and other activities. If you notice any odd posture or behaviour among frogs report that to Parks and Wildlife too (03) 6165 4305. If you see or hear a frog -get your frog id here: This works for other states as well. While I am waiting to hear if the Tasmanian Tree Frog Survey is still in progress, it wouldn't hurt to make a note if you hear or see one. Their call is on the website. P.S. If you are reading this Carmelita and Chris, I hope your Motorbike Frogs are back. These are a genuine Western Australian species and they sound just like that!